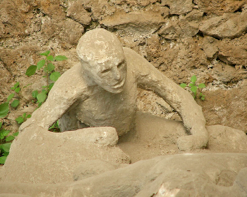 The majority of the inhabitants of Pompeii died because of poisonous gases from the Mount Vesuvius. Their corpses were entirely buried by hot ashes raining from the sky. 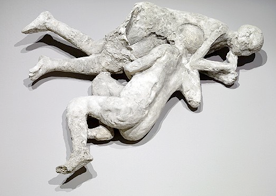 In 1870 the archaeologist Giuseppe Fiorelli used a technique based on filling the cavities generated where the corpses had decomposed with liquid plaster, in order to produce casts of the victims. Once the plaster had hardened, the surrounding soil was removed and the cast was brought to light. 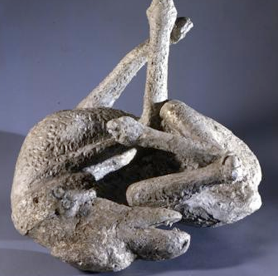 In Pompeii this technique was used to produce a number of molds of human bodies, animals and objects. Particularly interesting are the casts of the so called Field of the Fugitives, the entire family of the Casa del Bracciale d’oro, and the one of a man found in the Casa del Criptoportico on which are still visible the shoes he wore with the iron studs. On exhibition at the Antiquarium of Boscoreale is also the cast in epoxy resin made in 1984 on one of the victims found in the Villa of Lucius Crassius Tertius at Oplontis; this transparent cast allowed to spot jewels and coins possessed by the victim.